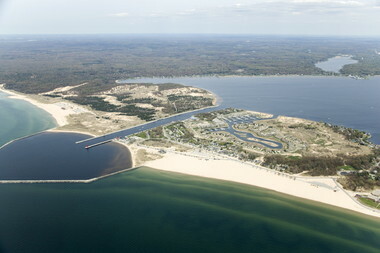 The 216-mile Muskegon River (Michigan’s second-longest) flows into Muskegon Lake and then through a one-mile channel into Lake Michigan. The county seat of Muskegon County is the city of Muskegon (pop. 38,401), the largest city on Lake Michigan’s eastern shore. Muskegon reached its peak population of 48,429 in 1950. 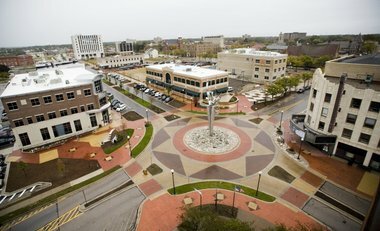 The many well-known people who were born in Muskegon include longtime CBS president Frank Stanton (1908), NFL quarterback Earl Morrall (1934), NBA player and coach Don Nelson (1940), evangelist Jim Bakker (1940), and 1965 Miss America Vonda Kay Van Dyke (1943). 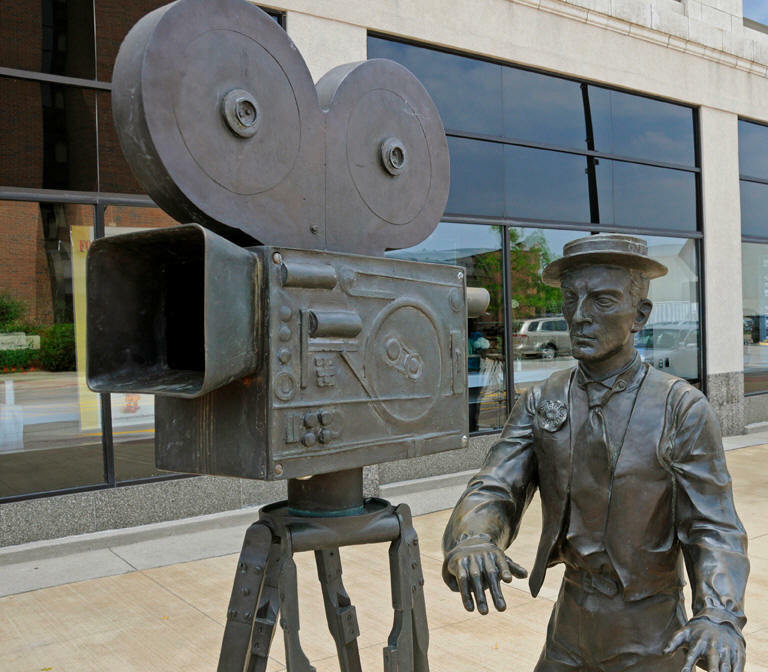 Silent film star Buster Keaton (1895-1966) spent many summers in Muskegon and considered the city his hometown. 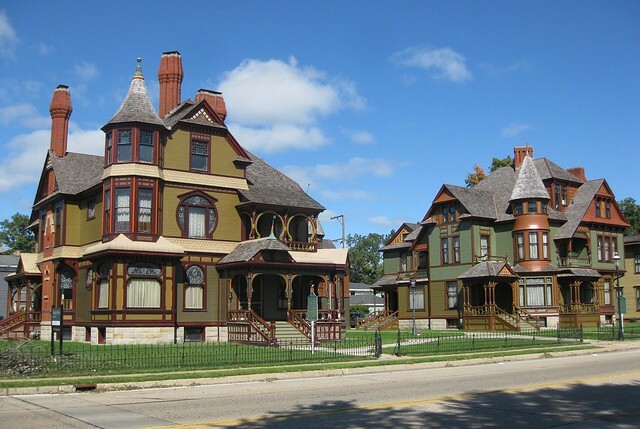 The homes of 19th-century lumber barons Charles Hackley and Thomas Hume are now open for tours. The Lake Express (2004) is a seasonal car ferry that connects Muskegon with Milwaukee, Wisconsin. It carries 250 passengers and 46 vehicles. It takes about 2.5 hours. The S.S. Milwaukee Clipper is a retired passenger steamship and auto ferry that was built in 1904. 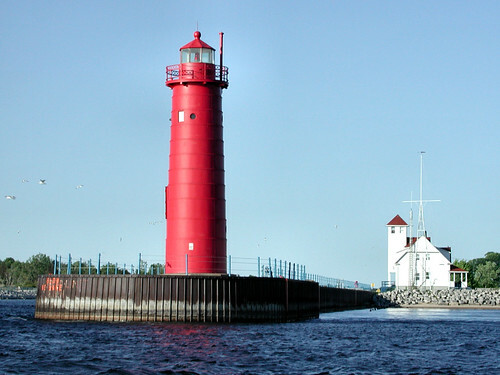 It is open for tours during summer on the Muskegon waterfront. Muskegon is considered the “Birthplace of Snowboarding.” Muskegon engineer Sherman Poppen made a rudimentary snowboard for his daughter in 1965 and later licensed the “Snurfer” idea to the Brunswick Corporation, which began selling them. Downtown Muskegon had an enclosed shopping mall for 25 years; the Muskegon Mall opened in 1976 and closed in 2001. The mall was torn down, and the area is now being redeveloped. The Mona Shores High School choir has an annual show at Muskegon’s Frauenthal Center for the Performing Arts, featuring “America’s Tallest Singing Christmas Tree.” About 200 singers stand on the 67-foot steel structure. Freshmen and singers with acrophobia stand on the stage. 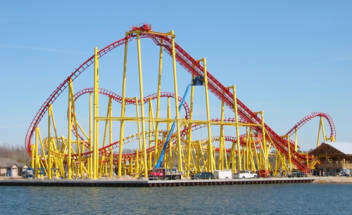 Michigan’s Adventure, north of Muskegon, is Michigan’s largest amusement park. When it opened in 1956, it was known as Deer Park. This entry was posted in Michigan and tagged America's Tallest Singing Christmas Tree, Iggy Pop, Lake Express, Michigan's Adventure, Muskegon, Muskegon Mall, S.S. Milwaukee Clipper, Sherman Poppen.